The misplaced reverence to the ill formulated U.S Constitution and hidden subjugation back to the City of London is one aspect of history that is not taught in government schools or discussed in institutes of higher education. This subject is probably new to most observers of the legacy from the Founding Father’s biggest mistake. Regular readers of BREAKING ALL THE RULES are familiar with the arguments made in the essays, In the beginning: Let there be the Articles of Confederation and Articles of Confederation was Preferable. Now the case for the betrayal of the purpose of the American Revolution needs to be explored. Cited on the US Constitution Gave Legal Ownership and Control of the United States to London site is an assessment by Michael Edward. "Neither the American people nor the Queen of Britain own America. The Crown Temple owns America through the deception of those who have worn their allegiance by oath to the Middle Templar Bar. The Crown Bankers and their Middle Templar Attorneys rule America through unlawful contracts, unlawful taxes, and, contract documents of false equity through debt deceit, all strictly enforced by their completely unlawful, but 'legal,' Orders, Rules and Codes of the Crown Temple Courts Our so-called 'judiciary' in America. This is because the Crown Temple holds the land titles and estate deeds to all of North America." An examination of The Templars of the Crown provides elaboration on this appraisal. For an even more in-depth analysis, review the material that probes AMERICAN LAND OWNERSHIP, A TRUE OXYMORON, which deals with the work of James Montgomery. Invest the time in discovering all the historic accounts, legal rulings and linkages that go back to the Crown, AKA, the City of London. If you are unfamiliar with The (British) Crown Empire and the City of London Corporation take a quick refresher course on the actual nature of the financial foundation and codified sanction that purports to be lawful. Jurisprudence may be legal by the definition and formulations of the judicious barrister class, but it certainly is not founded on the basic principles of natural law. Now this interpretation may seem bizarre to most and the plot thickens in the The construe Powers - Behind the Global Empire piecing together a long account of legalized equity mandates. The next element to consider has The Top of the Pyramid: The Rothschilds, the British Crown and the Vatican Rule the World. Read this account and trace back the historic lineage of some of the Englishmen who founded America. “To have the Declaration of Independence recognized internationally, Middle Templar King George III agreed in the Treaty of Paris of 1783 to establish the legal Crown entity of the incorporated United States, referred to internally as the Crown Temple States (Colonies). States spelled with a capital letter 'S,' denotes a legal entity of the Crown. As time proceeds, the sell out of the “shot heard around the world” revolution deepens. Two Constitutions in the United States. 1st was illegally suspended in favor of a Vatican “Crown” corporation in 1871. This approving assessment of the Federal Constitution views a Shadow Government in place since 1871. “Since 1871 the United States president and the United States Congress has been playing politics under a different set of rules and policies. The American people do not know that there are two Constitutions in the United States. The first penned by the leaders of the newly independent states of the United States in 1776. On July 4, 1776, the people claimed their independence from the Crown (temporal authority of the Roman Catholic Pope) and Democracy was born. And for 95 years the United States people were free and independent. That freedom ended in 1871 when the original “Constitution for the United States for America” was changed to the “THE CONSTITUTION OF THE UNITED STATES OF AMERICA”. This introduction to the actual influence and pompous legal authority that underpins the financial hierarchy is based upon a historic explanation that is foreign to most Americans. The implications are staggering and for this reason alone, most are not willing to do their own research. Do not get caught up in the uncanny departure from the usual rendering of reality. 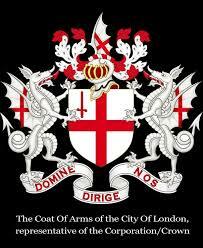 Remember that the City of London’s coat-of-arms reads in Latin - Domine Dirige Nos – which translates, Lord, direct us. The true question, asks just which deity do the soldiers of the Crown adore?